David Baker FAIA LEED AP founded San Francisco-based David Baker + Partners in 1982. With a focus on sustainable affordable housing, the firm has come to be known for combining social concern with a signature design character. A leader in the affordable housing sphere, the firm has designed and built more than 8,000 affordable units in the San Francisco Bay Area and has received more than 160 local and national architectural design awards, including the 2012 ULI Global Award for Excellence for the multi-generational Armstrong Place Senior and Family Housing. David was selected as the AIA California Council’s 2012 Distinguished Practice, in recognition of a career of dedicated commitment to the built environment. In 2010 he was given Hearthstone Builder Humanitarian Award, which honors the housing industry’s 30 most influential and innovative people of the past 30 years. From 1977 to 1982, David was principal of Sol-Arc, a firm dedicated to energy-efficient architecture. 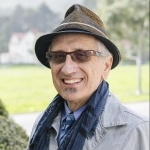 A progressive urban activist and bicyclist, he has also been a union carpenter, a teacher, and an active board member of the San Francisco Bicycle Coalition and SPUR (San Francisco Planning and Urban Research Association). Born and raised in a passive-solar rammed-earth house in Arizona of his father’s design, David has held a lifelong interest in architecture, design, sustainable building, and the DIY ethic. His newest projects are Zero Cottage—a net-zero LEED Platinum urban home—and StoreFrontLab.org, a year-long exploration of the storefront as a place of community, creativity and local industry.